Location: Smithville CVS, 1 S. New York Rd. On 12/29/12 at 5:27pm a white female described as; approximately 5’00” tall, 120-140lbs, blonde shoulder length hair, black leather jacket, and black pants. The female entered the store wearing a black mask covering her face and approached the Pharmacist at the Pharmacy. The female then held what was believed to be a handgun to the Pharmacist’s back and demanded money and prescription pills. The Pharmacist then provided the female suspect with prescription pills, and she fled the store. Officers from the Egg Harbor Twp Police Dept. and Stockton College Police Dept responded and assisted with maintaining a perimeter. A K-9 officer from Egg Harbor Twp, along with his K-9 partner, conducted a track of the suspect to the area of Waterview Dr., where the track ended. If anyone has any information regarding this crime please call the Galloway Twp. Police Dept at 609-652-3705. Ptl. Magazzu and Det. Casey are investigating. Where is Galloway Police mentioned in the article except for being a central repository for leads? 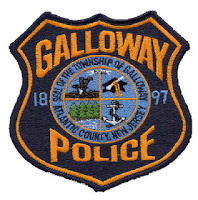 Is the Galloway Police Department that understaffed that we have to rely upon Egg Harbor Police and Stockton College Police? I was wondering the same thing! Why did Galloway Twp. Police not handle this call?? The article says EHT and Stockton responded and maintained a perimeter. Doesn't say they handled the investigation. Galloway is extremely short handed but are still doing their best.